This house was owned by Edward Carr Hordern. He named it “Chislehurst”. He died in Chatswood in 1940 aged 87. Edward was the grandson of the retailer Anthony Hordern junior. The Hordern family is an Australian retailing dynasty. They first came to prominence in Sydney as merchants and retailers with the establishment of Anthony Hordern & Sons and then gained notability in rural pursuits, stockbreeding, stockbroking, fashion, cricket and parliament. One of the Horderns settled in Wahroonga, Edward here in Chatswood. The Horderns owned many impressive properties in Sydney and the Southern Highlands. The Horderns were known as fitness enthusiasts, and enjoyed tennis, horse riding, walking and other outdoor pursuits. 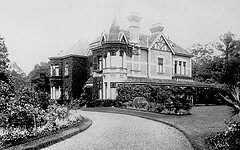 The house was built in 1892, originally called “Maroomba” by John de Villiers Lamb. Described as a fourteen roomed double storey house with stables, on fourteen acres. Hordern bought it from a K. Weidlmann in 1906, after he bought it in 1900 after Lamb’s death. The house was re-named after the birthplace of Edward’s wife, Lillie Carr Hordern. The city of Sydney was named after Baron Sydney of Chislehurst (United Kingdom). Hordern made additions to the house, including a billiard room, a ballroom, hothouse, a lift and stained glass windows. Edward Carr Hordern lived in the house until his death in 1940 and his widow and sister remained there until the house was vacated in 1953-4. My mother remembers the house, and says the front veranda was covered in the Hawaiian Bell Flower vine. The property was resumed by the Department of Education. Chatswood High School opened on the site in February 1959. Regrettably, the house was demolished some little time later. A brainless decision by a government bureaucrat. A new school was needed. However, a better idea would have been to preserve this grand historical house, and incorporate it as school offices or something similar. This is what happened with another Hordern property. Shubra Hall is now part of the Presbyterian Ladies College at Croydon. The stained glass window over the school Principal’s door is all that remains of the house. The local council tried to save Chislehurst, but the cost of seven thousand pounds was excessive. 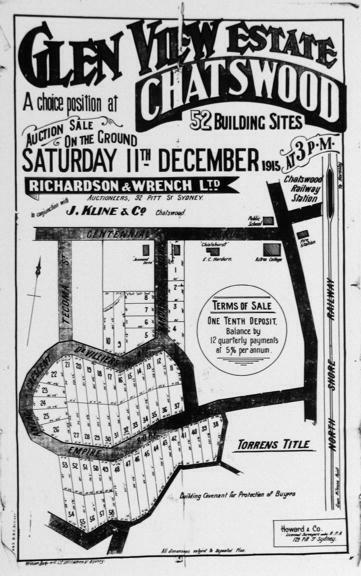 They argued that the remaining tall trees and “spacious flower gardens” should have become a botanic garden for Chatswood. There are tiny remnants of Blue Gum High forest at the school now. The council also mentioned “a miniature rainforest” at the site, which has also now disappeared. Just imagine that, a Botanic Garden close to the centre of Chatswood, it would be magnificent and very popular today. There’s some 22,000 office workers in Chatswood now. They’d love it for a lunch time stroll. Famous people living nearby when this house was standing include Errol Flynn (movie star), Kenneth Slessor (poet), Roger Woodward (pianist) and Victor Trumper (cricketer). They would all have seen it. Prime Minister Tony Abbott also lived nearby, but this was after the house was gone. This map shows the location of Chislehurst. The photo is courtesy of Willoughby City Library. The text was written by Peter Woodard.